Between having and infant at home, traveling to China for work, and lead writing an editorial for Landscape Ecology (with almost 20 other authors, who somehow have to agree on everything…), there just hasn’t been enough time to get out as much as I want this summer. 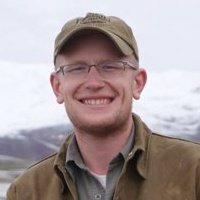 Sure, there have been a few notable exceptions (HERE, HERE, and HERE), and my work in China is at the impossibly beautiful Thousand Island Lake, so you shouldn’t feet too bad for me, but I just haven’t been living up to the out-every-weekend standard I’ve been used to over the past couple of years. In other words: Hello, adulthood. Something had to be done about this. So, with the editorial out to the other authors for a final review, and my brain fully converted to mush from the process of editing, re-writing, and re-editing the thing over and over again, I decided to take a personal day and get out of town. 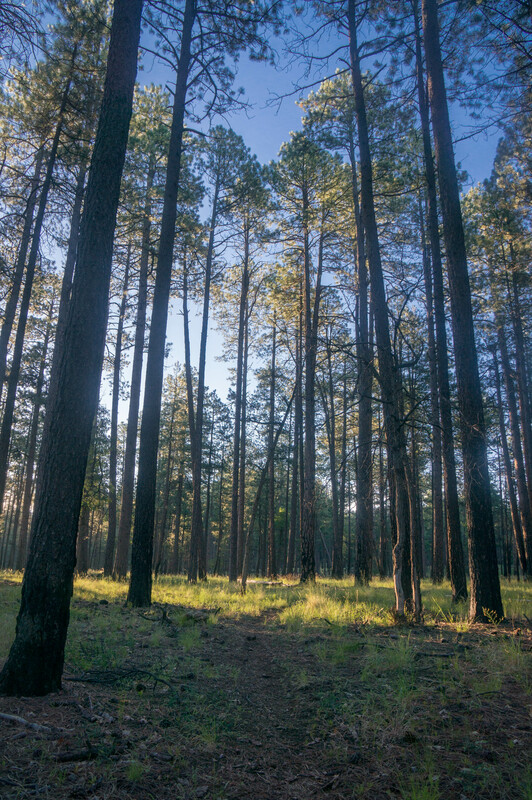 Knowing full well that I need to get my dissertation proposal revised and might not get out again for a few weeks, I wanted a hike that was not only hard, but could highlight all the best of what Arizona summer hiking has to offer. 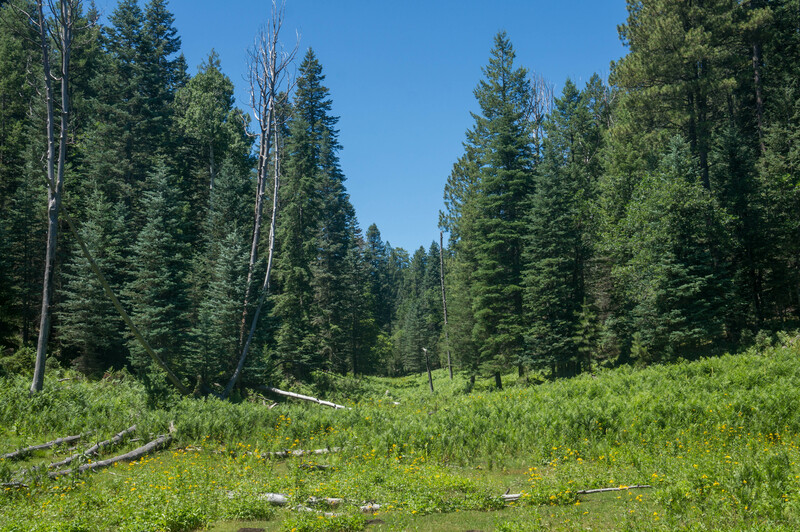 Big pines, giving way to aspens and firs, cut by small streams, big meadows and cool air; I wanted it all in one hike. Like I went over in my summer hiking guide, this leaves you with a three options. The most picturesque is Mt. 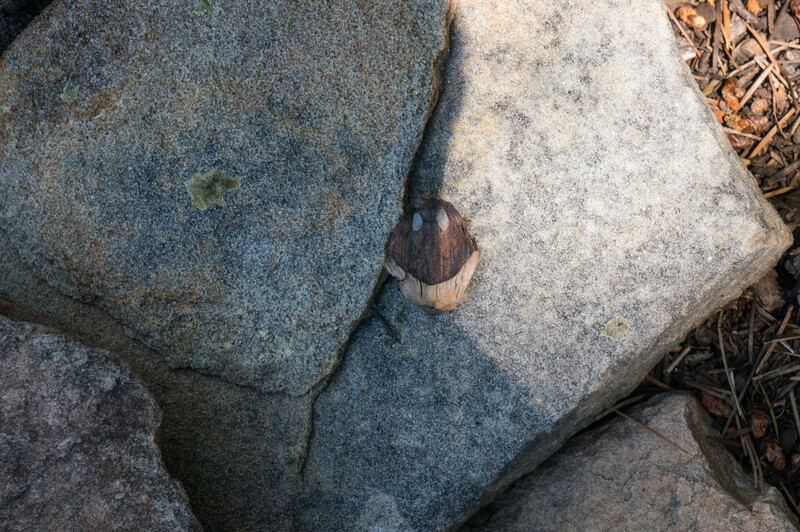 Humpreys via the Inner Basin trail. However, even though that northern approach is much less used that the southern side, Mt. Humpreys, especially near the peak, can get crowded. I don’t like crowded. Another option is the Mt. Baldy Loop, which is not heavily used during the week, but I was just there, and it is a really long drive. This left me with an old classic: the Eastern Cabin Loop. Now there are some downsides to the cabin loop. First of all, it may be the hardest hike to take pictures of in Arizona. 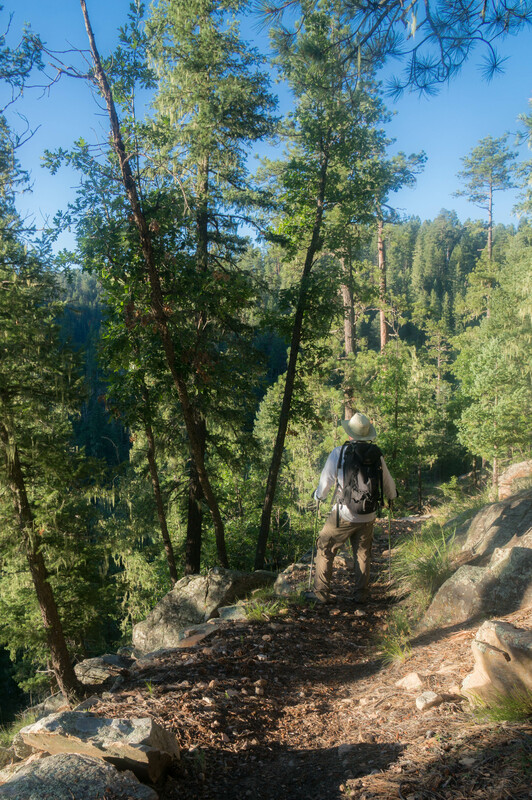 I know that is a strong statement, but what I mean is this: the hike is unbelievably beautiful, but constantly surrounded by tight forests, so it is almost impossible to get those big, sweeping shots I love. Combined with the fact I was going to be alone and Survivor Manning all my pictures, this presented a real problem. Second, the trails are notoriously hard to follow. This isn’t a problem for me, and frankly all but the Barbershop Trail are actually pretty easy to follow, but it is something you might want to know about. Third, it is still a pretty long drive, so I was going to be up early. Still, it is truly an Arizona Classic, so I set my alarm for 1:45 and got ready to go. Now, I know how much you guys hate LOVE history, so lets start there. Or, if you actually really don’t care about any of this, but you just want to see pretty pictures with me being tired, I conveniently marked this section out for you. Either way. 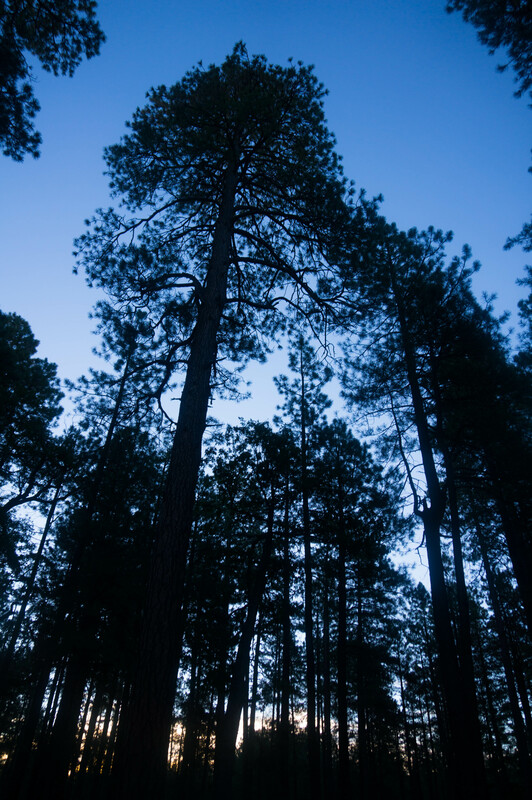 The Mogollon Rim is an enormous escarpment that separates the Colorado Plateau from the lower deserts of the southwest. Rising from a floor of about 5,000ft to about 8,000ft the cliff face itself is huge, and, if you are afraid of heights, probably super terrifying. 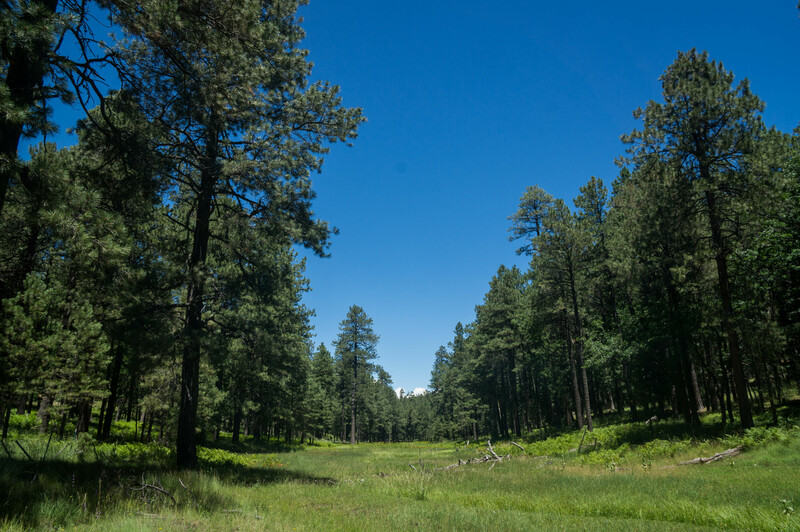 Mixed with the summer monsoon, this sudden change in elevation means that the rim receives absolutely prodigious amounts of rain in the summer. All this water then flows off to the north, where it eventually joins the Little Colorado River (yes, the same one you see on the West Baldy Trail), cutting deep, deep canyons along the way. What this means for you, the hiker, is that trails that head N-S in the region are generally pretty easy because they follow the natural flow of the land, while trails that head E-W run perpendicular to the watersheds meaning you are going to have to descend and climb large canyons every couple of miles. Yay? In the mid- and late-1800s the area was mostly used for sheep and cattle herders to move their livestock out of the blazing summer heat just a few miles away. 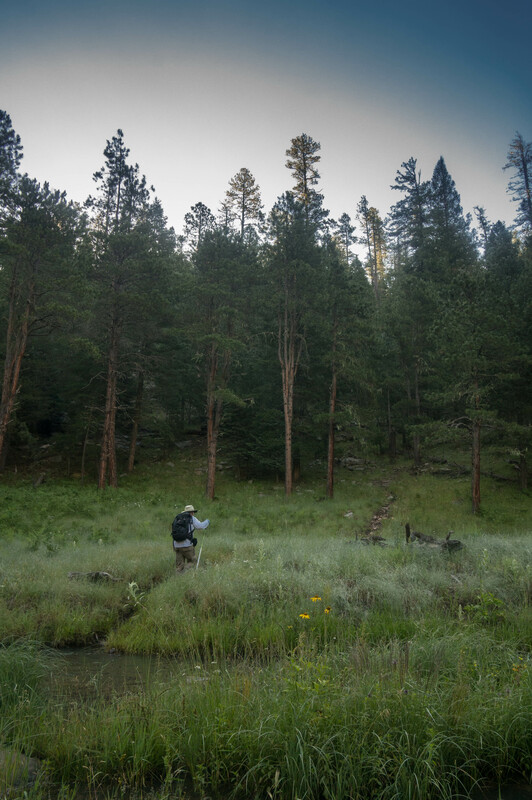 As you might imagine, these people were profoundly weird; however, even weird people get lonely, so they built a small system of trails that could connect their various homesteads. A little later on, some important people to American history took over these cabins. 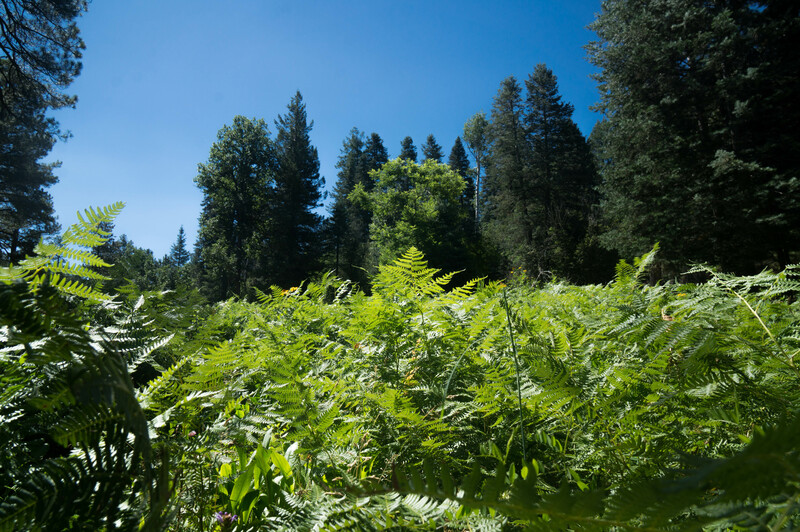 Gifford Pinchot, who first popularized the ideas of sustainability and was the first director of the USFS, lived in one of the cabins for a time, as did famous writer Zane Grey. More darkly, General George Crook also used General Springs as a base of operations during his campaigns against the White Mountain Apaches. 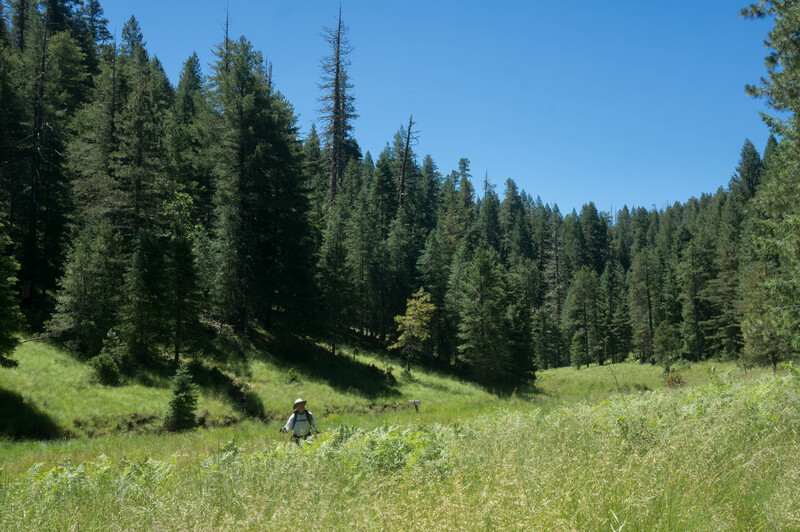 One of the major battles of the Apache Wars, the Battle of Big Dry Wash, was fought right next to the trail system. Put all this together and you get the names we still see today: Pinchot Cabin, General Springs Cabin, Dane Canyon, Houston Brother’s trail. Of all these the best has to be Barbershop Canyon, so named because the ranchers of the period would gather there and pay the local sheep herder to cut their hair using his sheep sheers. Like I said, these were weird people. Beyond the names, a lot of the history still remains. 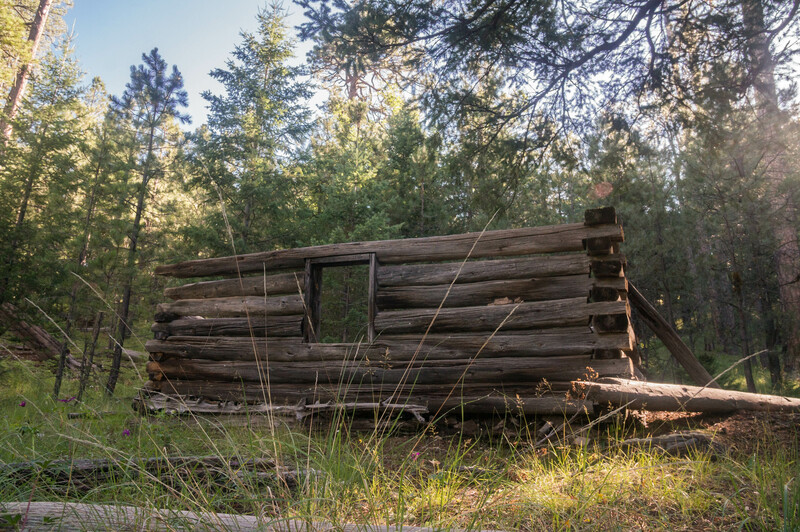 Zane Grey’s cabin still stands in its original form, as do cabins at Aspen Springs, and Fred Haught Springs. Cabins have been restored at Pinchot Springs, General Springs, and Buck Springs. 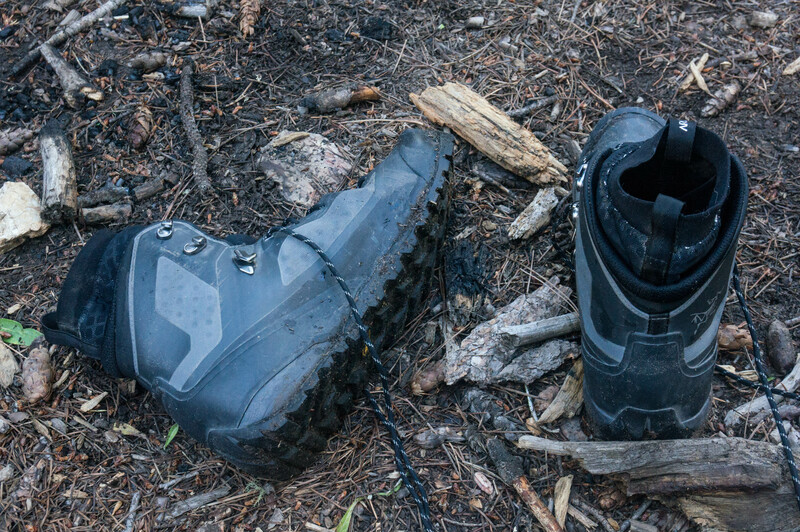 The forest service call’s the system a “walk through history,” which it certainly is, though I’d love to see a little more attention paid to the people who lived there before Crook came through. For those of you who aren’t from Arizona, there is no way I can explain to you the importance of this picture. 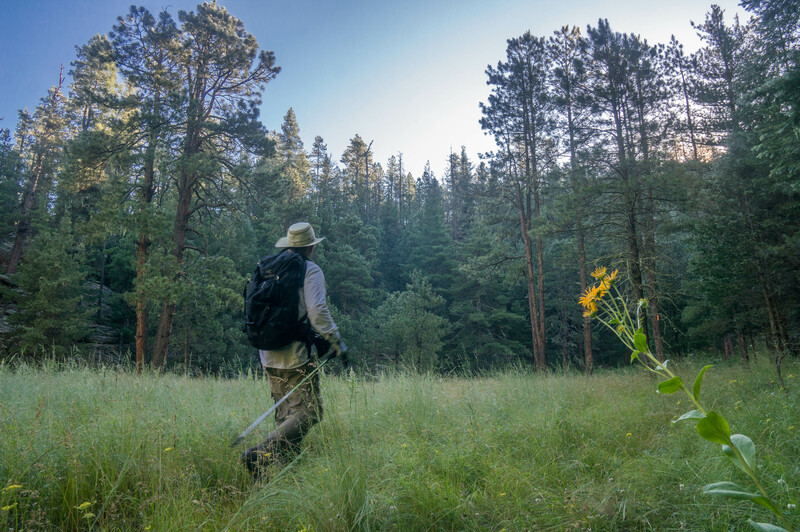 Arizona summer is otherworldly: In the lowlands it never cools off; At 3 in the morning it is regularly above 90 degrees; When it rains, the raindrops are as hot as bathwater; Worst of all, this starts in early May and ends in early October. For someone like me, who spends at least a few hours outside in the heat every day, you just forget what it feels like not to be hot. 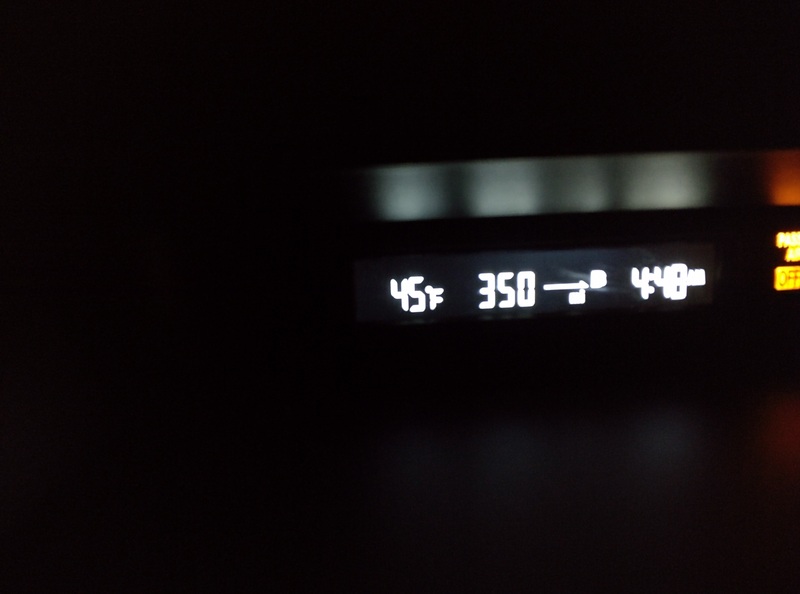 When I looked down and saw 45 degrees on my car’s thermostat, I almost cried. As you saw on the map above, the Cabin Loop isn’t a loop at all. It is a heart shape with eastern and western halves that are around 20 miles each. 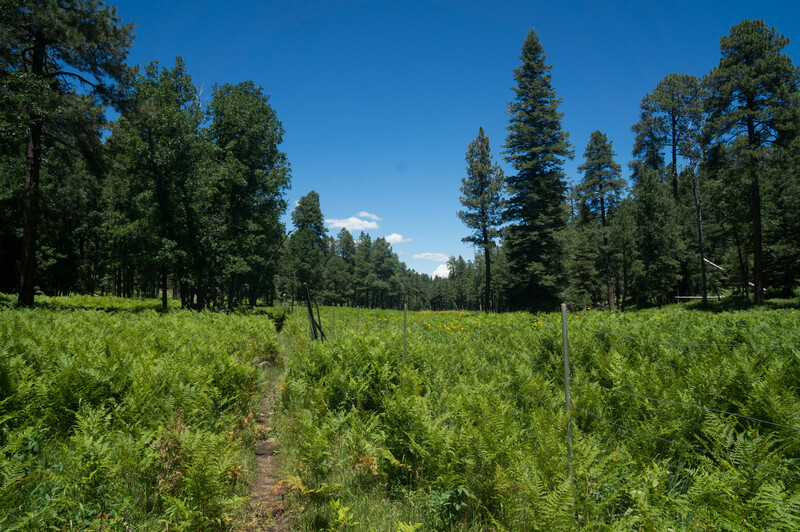 The western half is pretty, and makes up part of the Arizona Trail, but it is much easier and requires a LONG road walk along the busy FR 300. I’ve done it once, an I don’t really plan on doing it again. The eastern loop is a little bit shorter, but cuts through much deeper canyons. 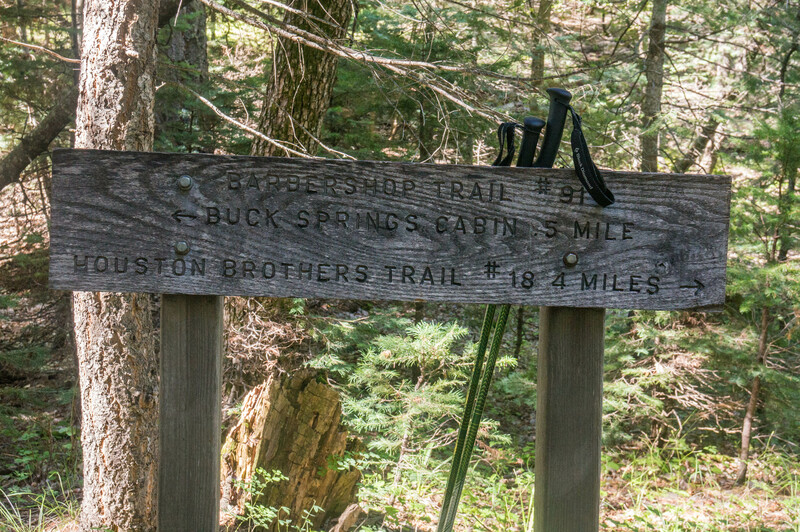 Both these loops meet at Pinchot Springs, which is where my fun began. Because U-Bar is cutting E-W at this point, I was quickly into some major canyons. While there are a few smaller draws before hand, the first major obstacle comes at Barbershop Canyon. The descent into Barbershop is pretty brutal (about 400 vertical feet in a little less than half a mile). I did see a group of bull Elk on the way down though, which softened the descent. The bottom is amazing: ferns everywhere, trees slack with moss, even a little creek that runs during wet times. With a small group you could camp upstream, but I think you would be better off pushing towards our next canyon. I’ll be honest with you, climbing out of Barbershop is hard. 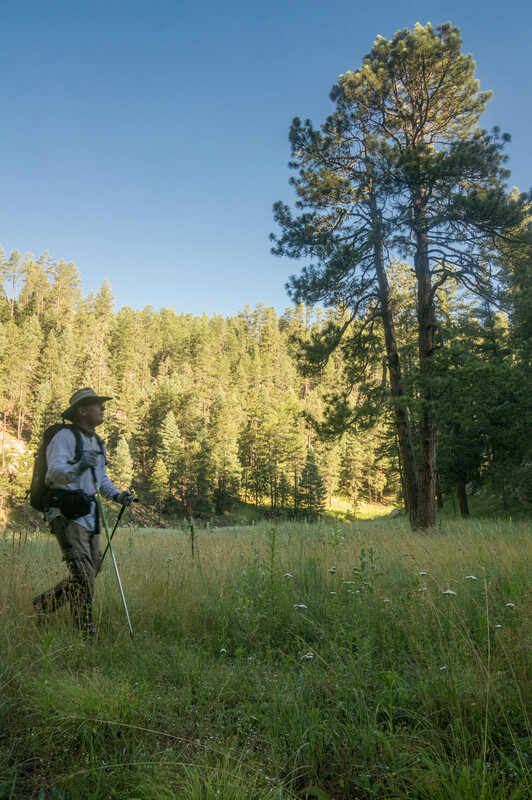 Though short, it goes step for step with some of the toughest spots in the Grand Canyon. You’ll be happy to be at the top. Let’s put it this way: I was not going to walk that canyon a couple of times so I could get pictures of myself. Once at the top there was no rest for the weary, because just a mile of rolling hills later, I started descending into Dane Canyon. Of all the places you could camp along the U-Bar Trail, this is my favorite. 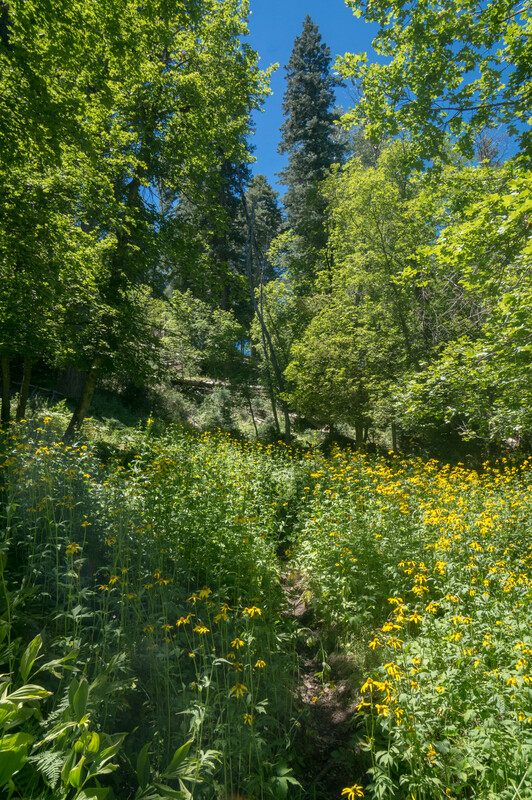 The canyon is tall enough to make you feel secluded, but wide enough to offer great camping spots. Best of all, if by some crazy chance there is no water here, Dane Springs is relatively near by and you could top off there. Even better, because you take a southern turn here the hike out of Dane isn’t nearly as bad as the hike out of Barbershop. After working my way out of Dane Canyon, I started the slow, gradual climb to Dane Springs. It’s not far, only about a mile and a half or so, but this section always seems to drag to me. Once you get there, it is a great place to take a break. 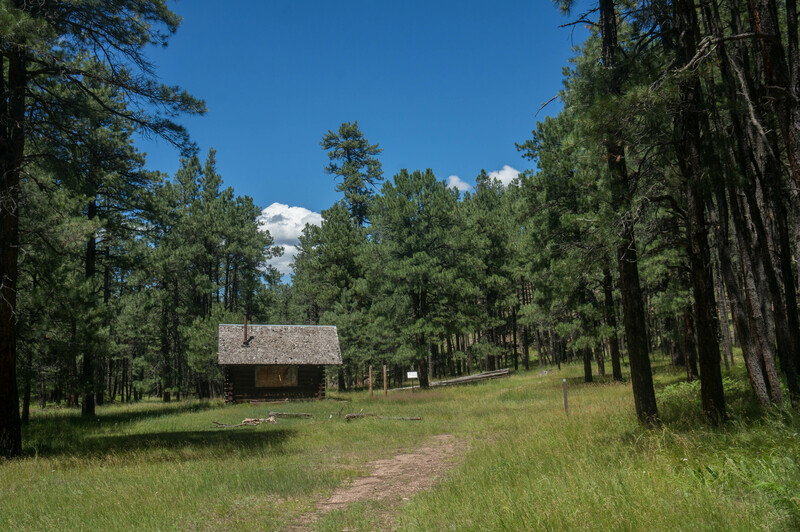 Nearly 100 years later, Zane Grey’s cabin is still going strong! That being said, as I walked into the cabin area to sit down for a snack, I was horrified to find a camp fire ring inside the cabin. I was simply dumbfounded: why in the world would you risk destroying such an amazing relic when there are ton’s of campsites near by? 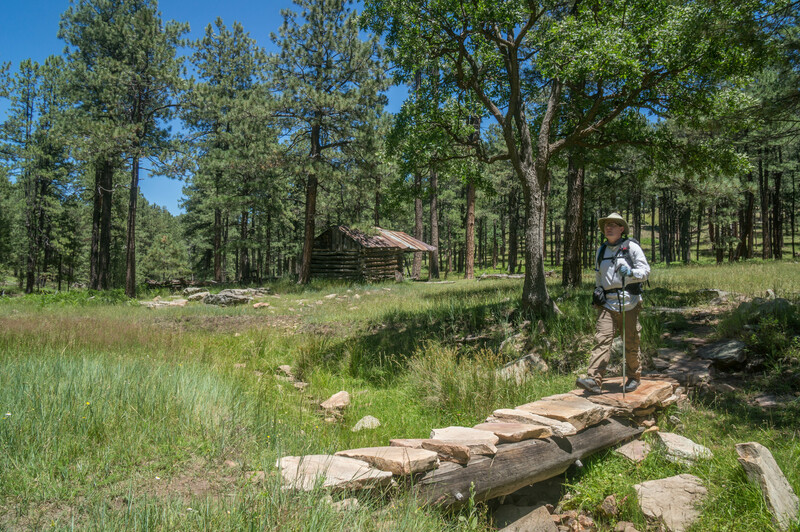 Hikers and backpackers even have a history of accidentally burning down important places in the sate: this is precisely how another really famous cabin in Arizona, Reavis Rach, was destroyed. 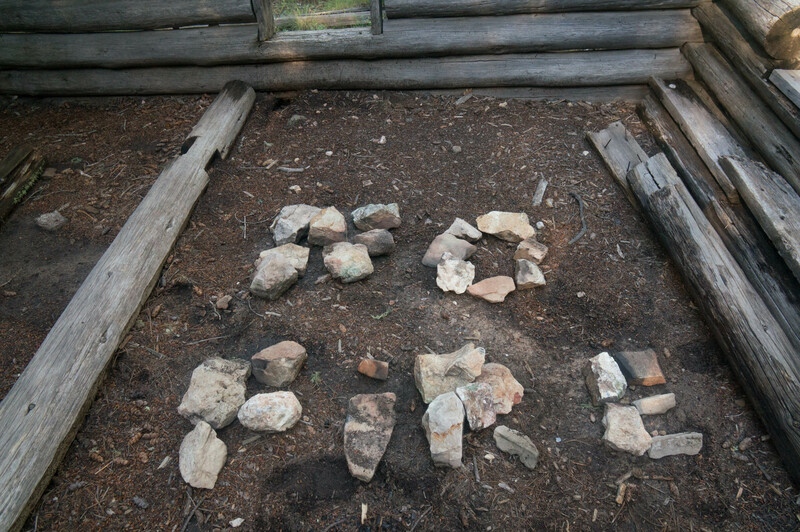 All this in mind, I converted their fire ring into a useful message. I felt very clever, and, important jobs done, I decided to air out my feet and grab a snack. It was basically the best idea ever. It is probably worth noting, that this is the inflection point of the hike: The shortest route back is the way you came, but that direction is also way steeper than the route ahead of you. If you don’t think you are up for the remainder turn around right now, any further and it will be easier to go forward than back. Leaving Dane Springs, the vegetation immediately changed. 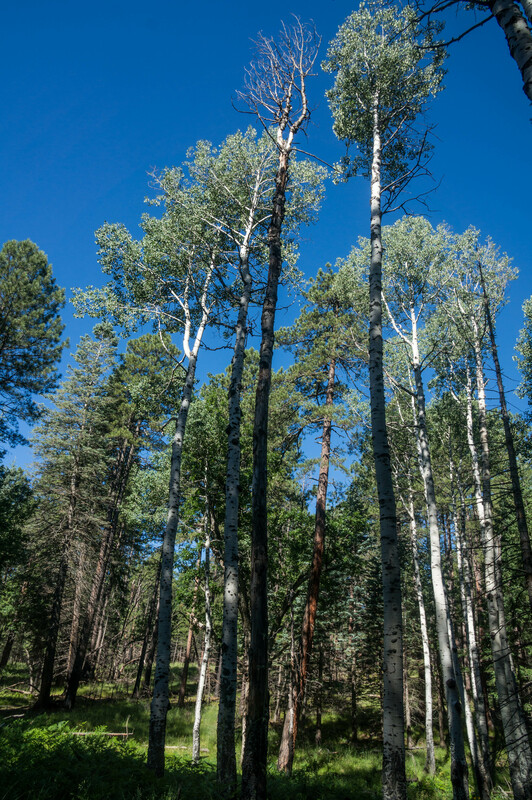 Pines are replaced with aspens, firs, and spruces. As I moved further and further south, the change got more and more distinct. By the time I reached the junction with the Babershop Trail, it was like a whole other forest. 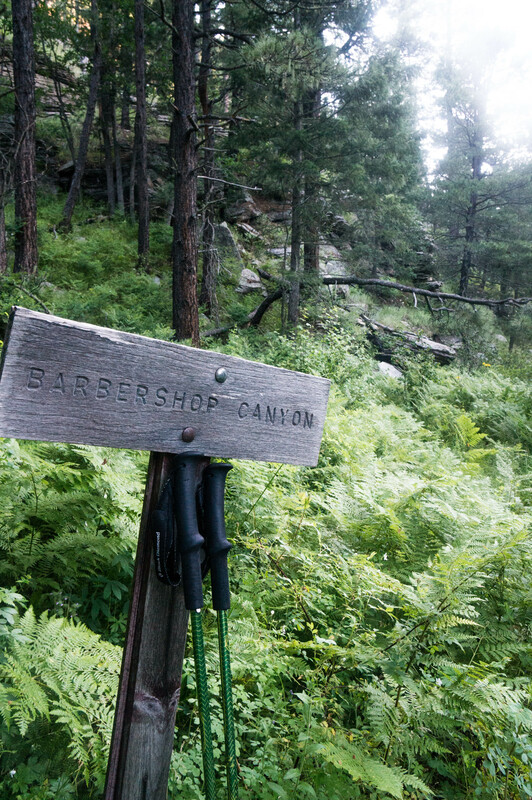 The Barber Shop Trail is the crown jewel of this hike. I said in my summer hiking guide that this trail is basically unused, and that proved true on this trip. Huge sections of the trail were downright hard to follow. If you are a newbie reading this you might want to think twice before attacking this section of the loop without help. 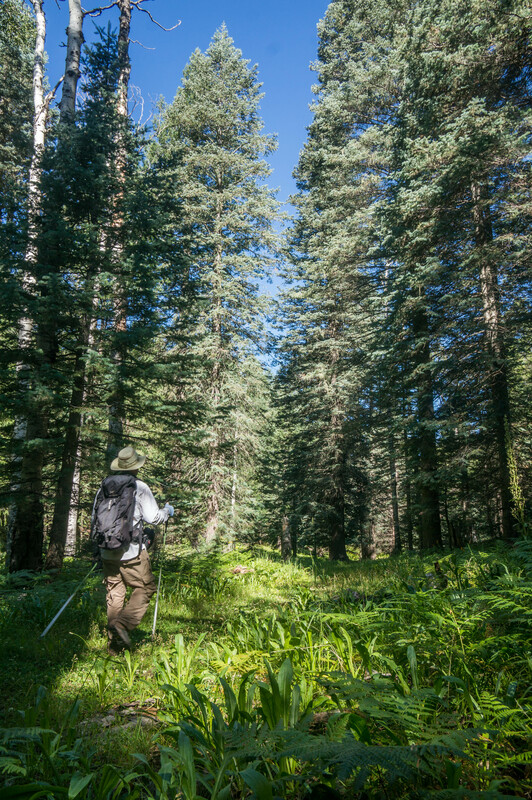 Experienced hikers should be fine, but regardless, get a map and learn how to use it. 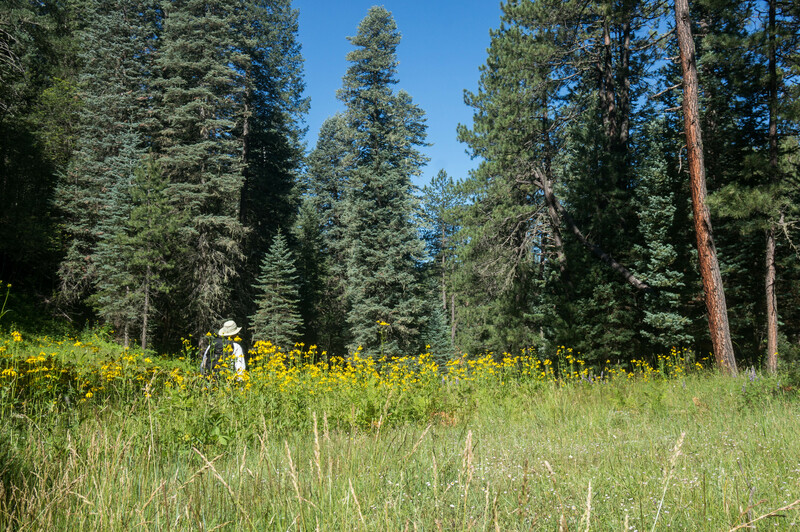 Once you get used to the lack of a trail, this section is amazing– tight forests, big meadows, lots of flowers. 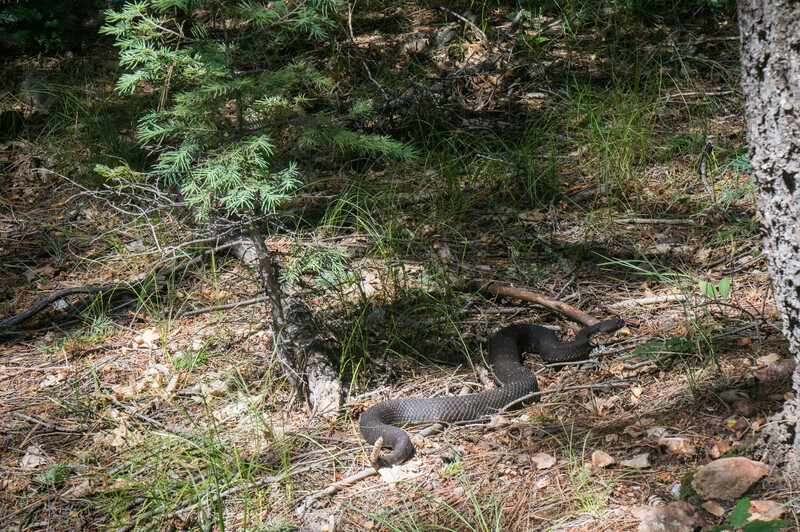 I even saw my first Arizona Black Rattlesnake. Unfortunately though, you are now back on an E-W trail, which means you’ve got to pay the canyon piper. This means climbing Dane and Barbershop Canyons again, though they aren’t as bad this time since you are closer to the headwaters. 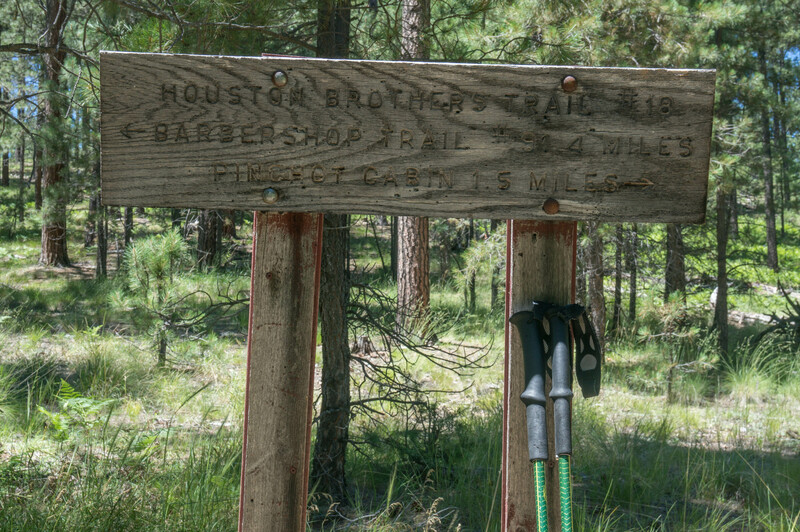 All good things must end though, and after a tiring hike out of Barbershop Canyon, you find yourself at the Houston Brother’s Trail. 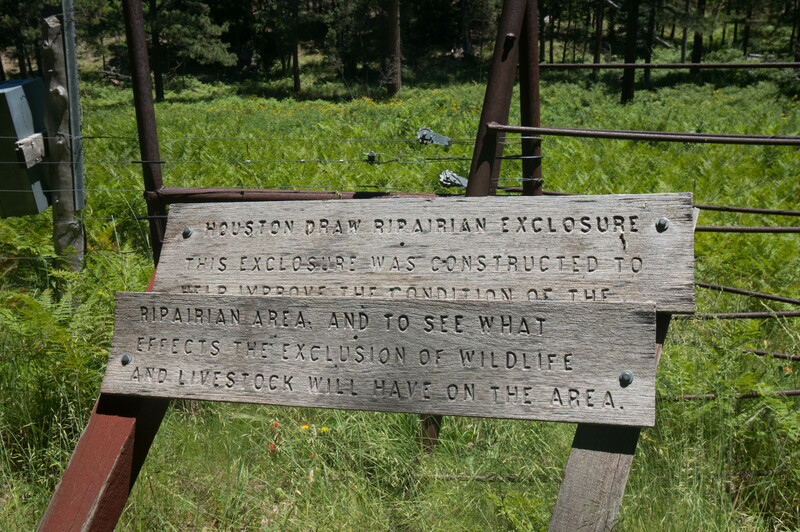 A quick look at the map suggests that you will now walk along Telephone Ridge, before descending into Houston Draw back to the car. Dictionary.com defines a ridge as “A long, narrow elevation of land.” Now, it is probably safe to say that my ancestors didn’t have access to Dictionary.com while naming everything in this area, mostly because there was no internet in the 1800s. Plus, they were quite stupid. That being said, telephone “ridge” is not a ridge at all– rather it is a set of small gullies with just the kind of constant up and down action that you are not looking for on the tail end of a long day. Fortunately Telephone “Ridge” did end eventually, dropping me in to Houston Draw. Here I could finally reap the rewards of hiking the loop clockwise, as the final four miles back to the car were a nice, gradual downhill. 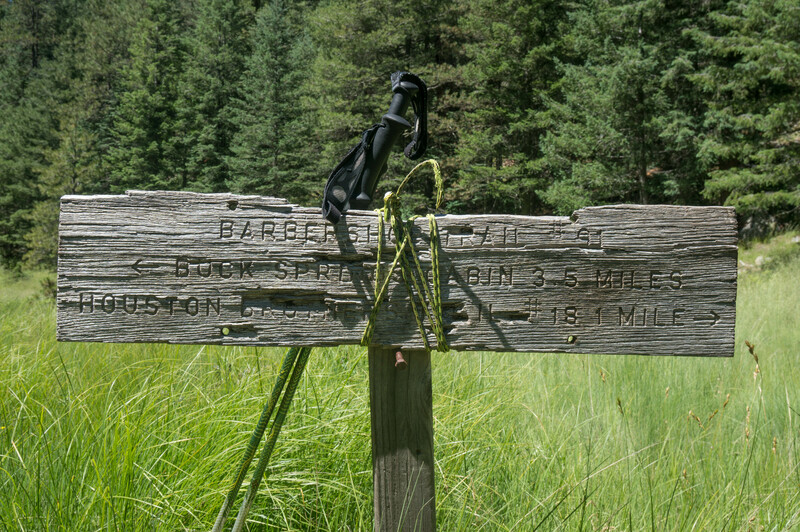 About a mile and a half from the end of the hike I came to Aspen Springs. The cabin here is mostly original and (outside the picture) there is an enormous stone fireplace. 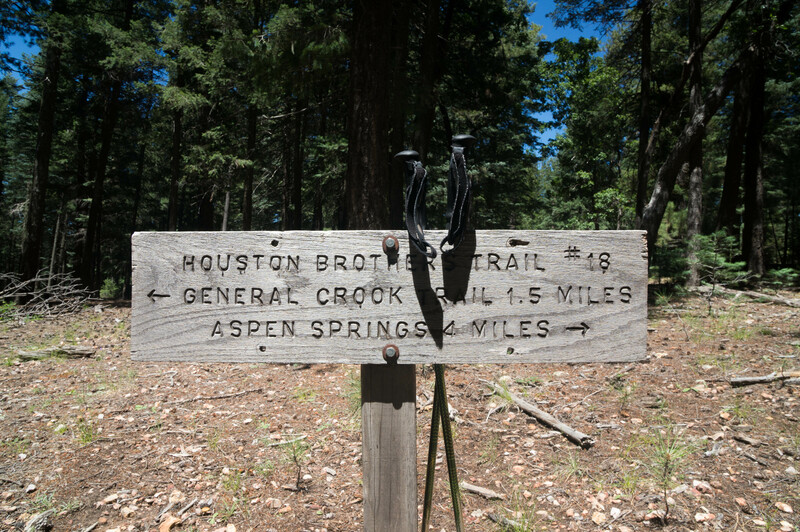 Given the ease of the hiking on this part of Houston Brothers, this would be a great, super easy place to come for a first backpacking trip or a quick summer hike. Water isn’t super reliable here though, so be warned about that. 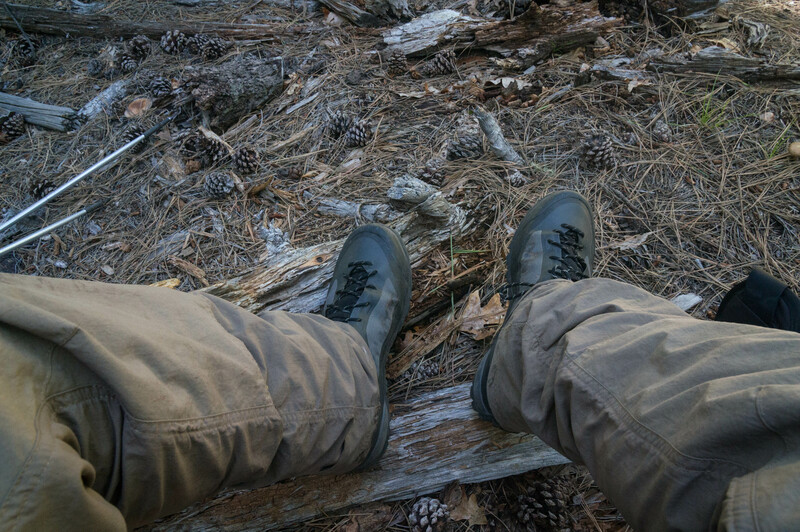 30 min down the trail and I was back to Pinchot Cabin. 17.12 miles and 3500 ft of elevation gain/loss, I wasn’t dead, but I was happy to be done. All told, the hike was great. Taking into account the elevation, it is a little long for a day hike, but would be the perfect overnight backpacking trip. 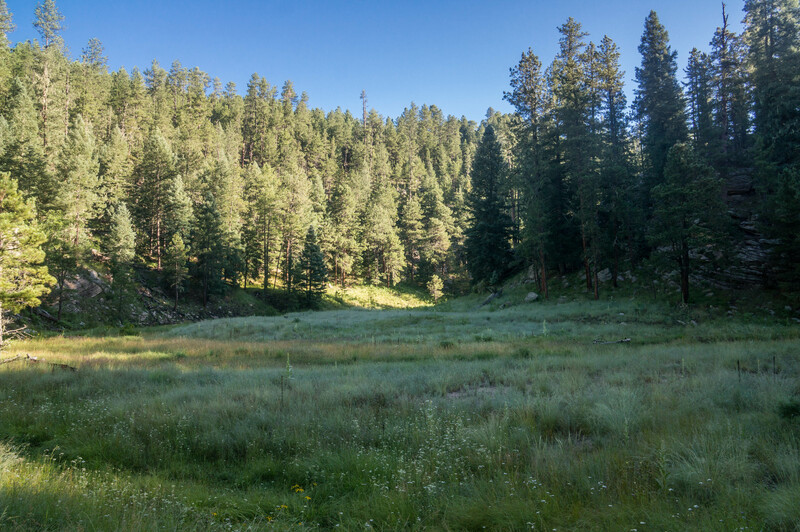 More importantly for me, with tons of history, wildlife, and trails, the Cabin Loop has everything you want from summer hiking. If you can’t get out as much as you want, don’t worry, with the Cabin Loop you can still have all summer in a day.